Firstly, it goes without saying, it was just stunningly beautiful. Rugged yet not barren, imbued with all the jewel colours you could imagine. That sapphire sky! Those emerald cliffs! And the sea, oh the turquoise of the sea. 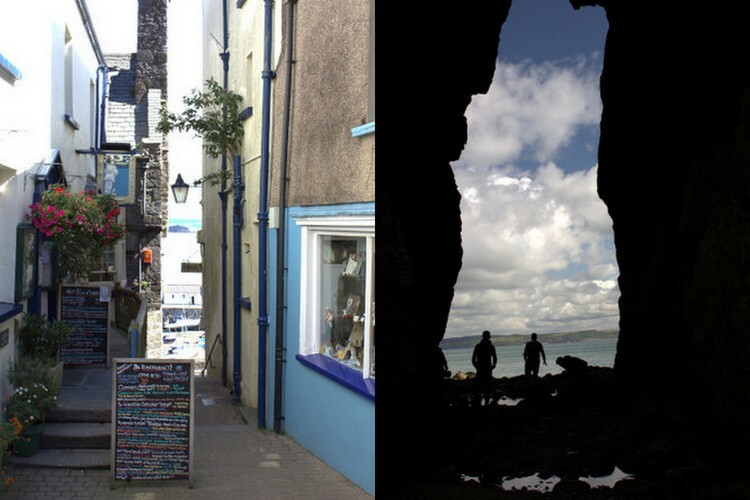 Pembrokeshire is also full of pretty, ice-cream coloured towns and villages. There are the tacky bits, but most of it is the sort of place that makes you wonder about moving there. Look, I even dressed nautically for the occasion (let's pretend it was happy happenstance instead of my usual embarrassing need to theme everything). 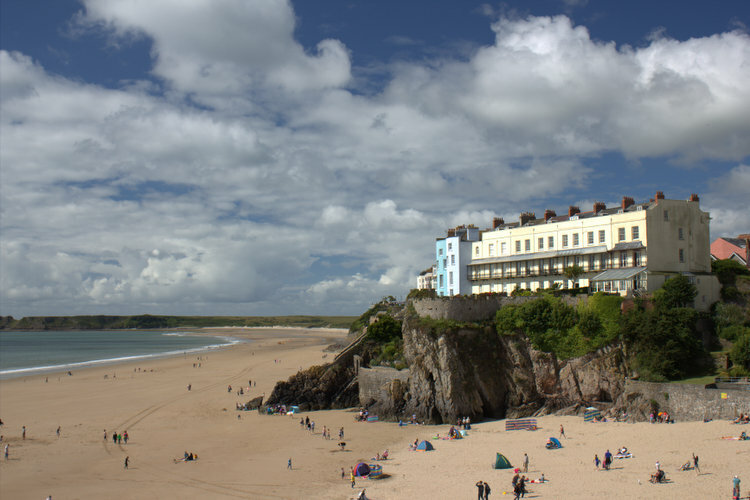 We had a beautiful day out in Tenby. The beach, well just look, are words needed? 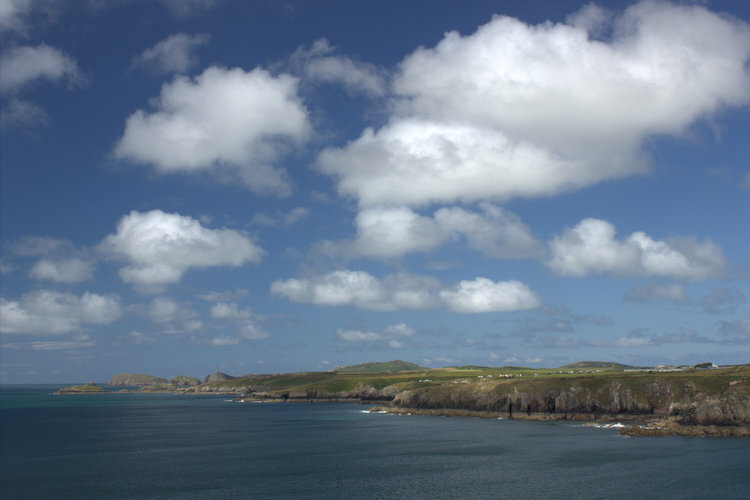 I highly recommend the little walk around the headland that the tourist office there suggests. You get to see the most amazing lifeboat you'll probably ever see. 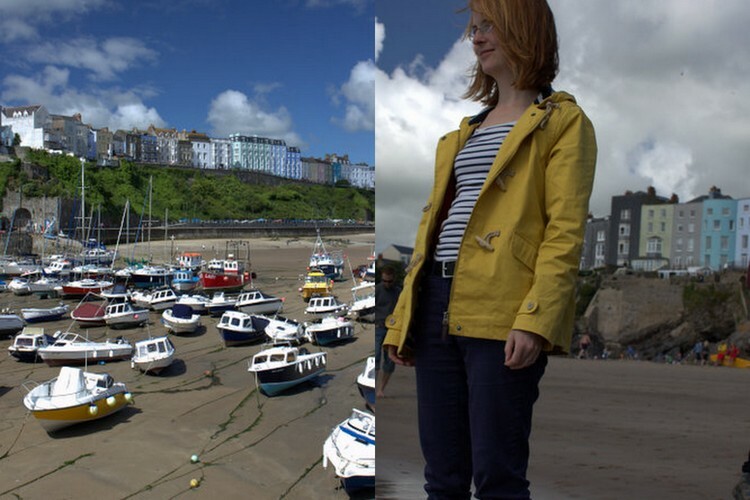 It's got all the little nooks and crannies you'd hope for, whether those in the town or down on the seashore. 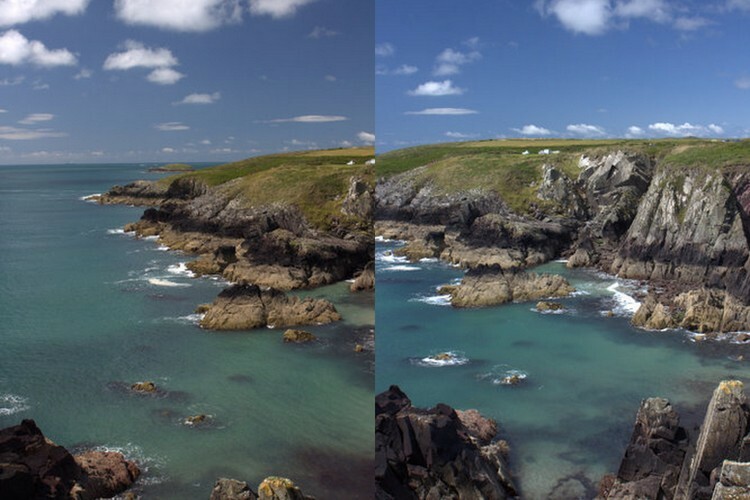 I'm not sure how to say this without sounding like a snotty southerner, but Pembrokeshire will appeal to you if you like Cornwall! 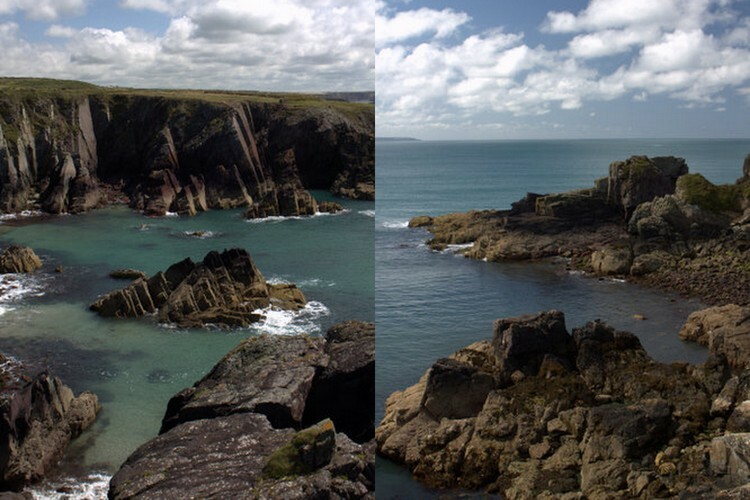 Another highlight, during the second half of our week, was the most beautiful coastal walk along the Pembrokeshire Coastal Path. It really was my most favourite part of the holiday. 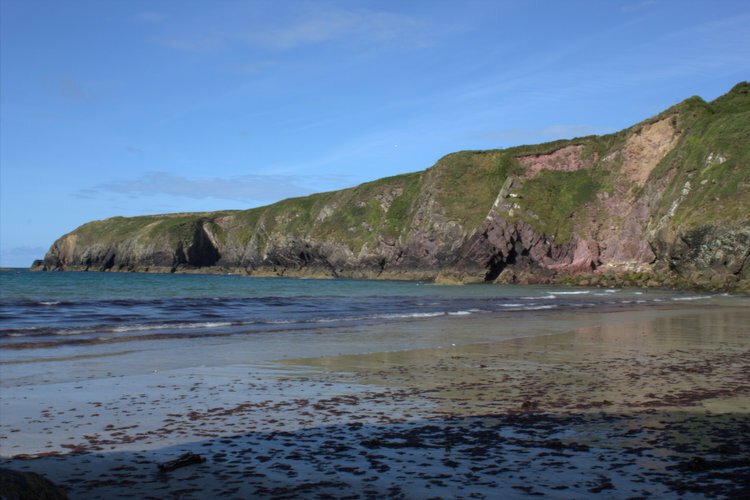 The Little One and I caught crickets, we all watched in awe as coasteering teenagers appeared through gaps in the cliffs, we ate ice creams at the beautiful harbour of Porth Clais, and marvelled at every new view as the path twisted and turned. It was worth the holiday alone. And that's saying something, because on our second night at the campsite half the tents were irreparably damaged by a huge storm, and ours was broken too. We were lucky to find somewhere to fix our broken tent poles. Being huddled in a tent with screaming winds around you, frightened children clinging to you and your husband and mother outside wrestling guy ropes while being battered by the elements does not appear in the dictionary's definition of 'holiday'. When the second storm hit 48 hours later, we weren't going to take any chances so we packed up our entire tent and luggage, drove to the nearest Travelodge for the night, and then came back the next day to set everything back up again. This does not appear in the dictionary under 'relaxing' either. But just look at those views! It was almost as though the coast was apologising to us. And, battered though we were, we crumbled under the pressure of such beauty and forgave it. 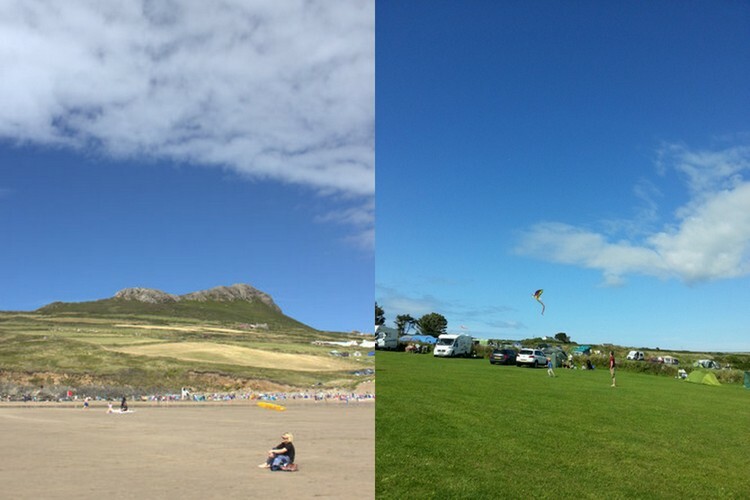 The second half of our holiday also included a trip to the surfer's Whitesands beach for paddling, wave jumping, sandcastle building, and, of course, wind breaking. 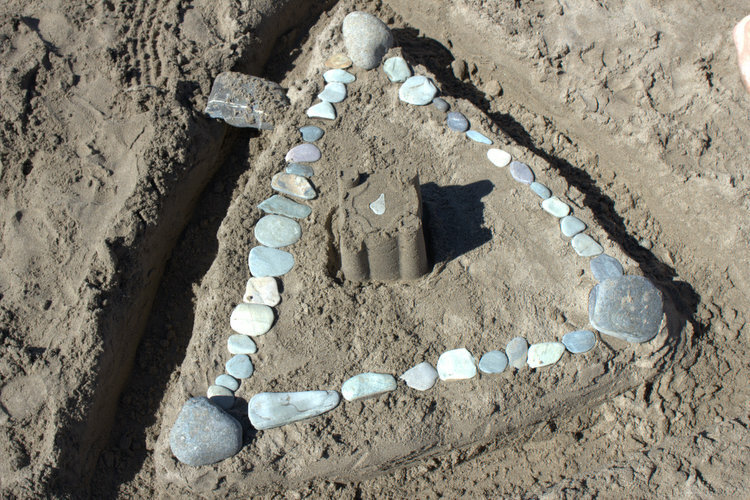 Some geometric castles were built! For this one my husband was the put-upon assistant. I helped with the square and circular variants but I think his was best (don't tell him I said that). Possibly the most beautiful yet missed part of our visit was St Davids Cathedral. We briefly saw it (just look at those cloisters!) 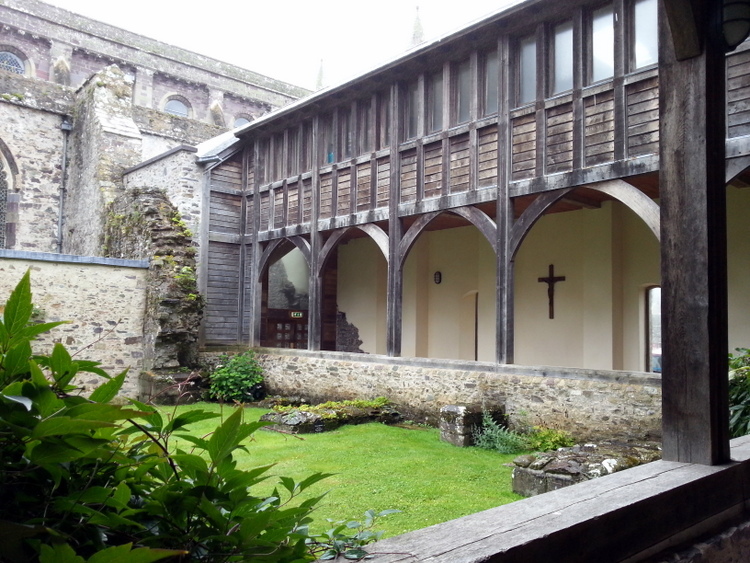 when searching for somewhere to eat lunch between rain showers (it has an impressive refectory) but because the weather truncated our holiday sightseeing, we missed out on a proper visit. 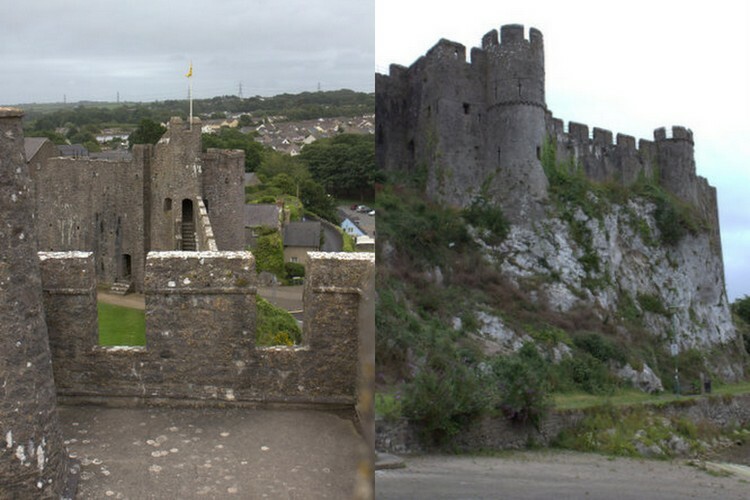 I'm sure this was fate's way of getting us to go back to St Davids again. 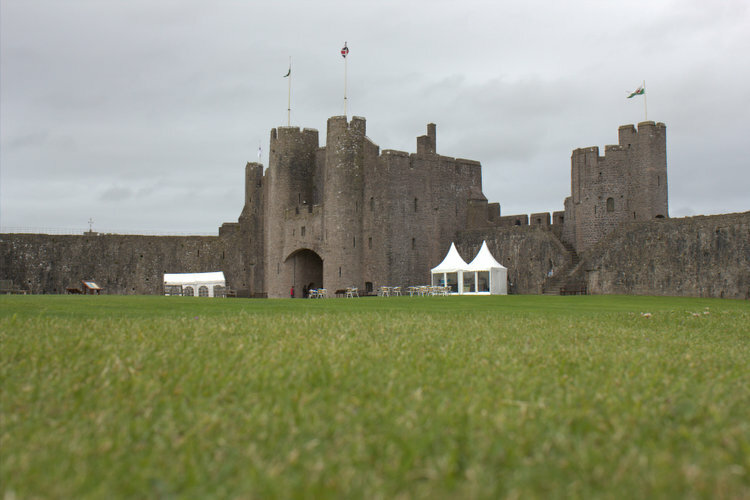 We stopped off, near the end, at Pembroke Castle which has to be one of the best I've ever visited (and I've visited a lot). It was stunning. Truly stunning. Even under grey skies and with the highest sections shut due to the wind speed. Our boys relished the chance to be knights and kept in character all the way around our exploration of battlements and rooms. 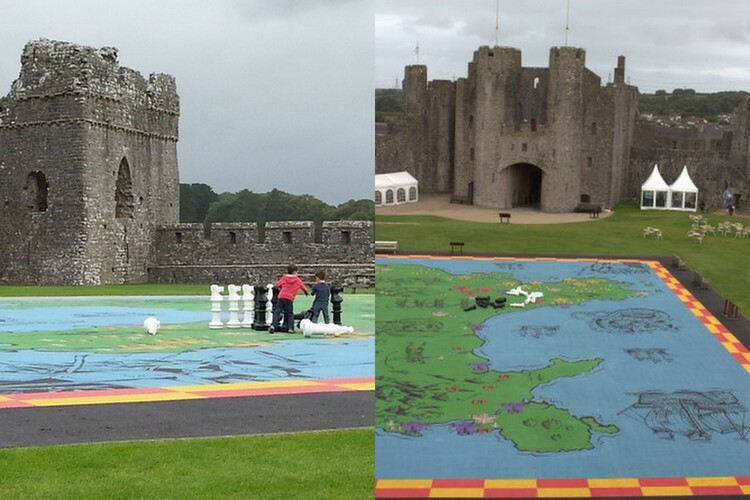 They even have a giant map of Wales and giant chess knights to play with! I don't know exactly what they were in those boys' eyes but they played very earnestly with them for a good twenty minutes! Go. I suppose that's the two letter word that sums this all up. Just look at those skies below! Just look at the sun on the calm sea. Even with all the hell thrown at us in the first four days, we came home slightly in love with the place. 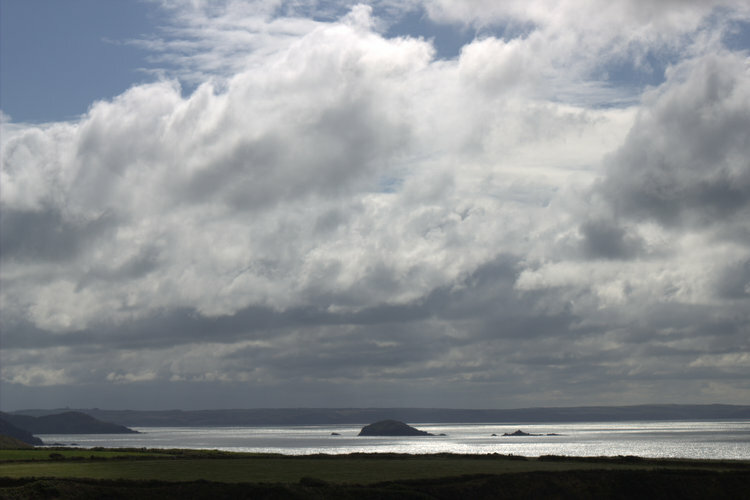 Though if we book to go again (and we stayed at St Davids' Caerfai Farm campsite, which was organic and a little basic in places but just what we were looking for and exactly what we'd recommend) we'll change our minds at the last minute if storms are forecast. We're fair weather campers from now on! Thanks Julie, that's very sweet of you! I think we'll have to go back once the memory of those storms has properly faded! Thanks for the great suggestions Lizzie. I'd love to explore the north. From a cottage not a tent, obviously! 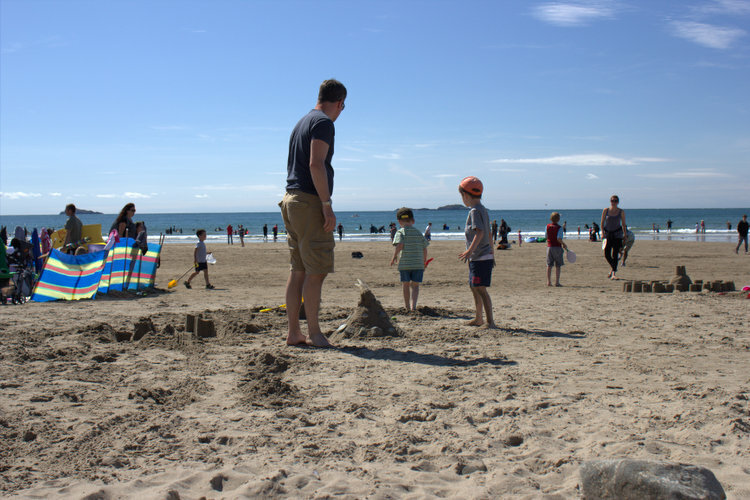 Ah we had a wonderful holiday in Pembrokeshire too, must have been a different week to you though and we rented a cottage rather than camping! If you do go again I'd recommend a boat trip to one of the islands, we went to Skomer and had a wonderful day (it's costly for a family of 5 but worth it) spotting seal pups.